Laughter is great for business. 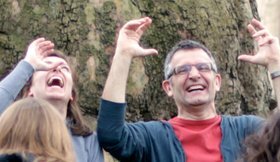 More and more research is showing why laughter needs to be taken seriously. Happy staff are more productive, more efficient and take fewer days off on sick-leave. Laughter can transform well-being, energy and performance at work. 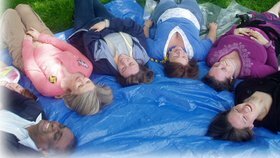 We can provide everything from dynamic laughter energisers and laughter yoga workshops to team-building workshops and all day wellbeing programmes. We have experience in designing and facilitating workshops for organisations large and small, local, national and international - be it 5 people or 500! Bespoke workshops will suit groups of any age and all levels of mobility. You will see, feel and hear the difference! What are the benefits of more laughter at work? info@ shinetime.co.uk - we'd love to hear from you!